If you forget your password and need to reset it, we’ll send a password reset link to your recovery email address. Without this secondary email address you could get locked out of your email account. If your email address creation confirmation email hasn't arrived yet, the steps below won't work. If this is your first Office 365 account with GoDaddy, the steps below are for you. If you've already set up an Office 365 email address with GoDaddy, or don't remember setting it up, go to the More info section in this article for instructions. 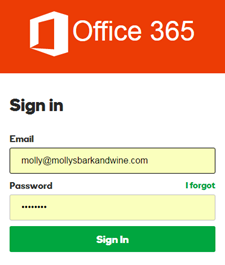 Enter your Office 365 email address and password and click Sign In. Enter your recovery email address and click Save. Once your recovery email address is saved, you'll be directed to your Office 365 Apps page. To finish setting up your online options, click Outlook. Select your language and log in options, then you'll see your Outlook inbox. This is the easiest way to access your email inbox to send and receive email. Now that you added your recovery email, we'll show you how to set up your email account on your phone, computer or both! Step 3, let's get your email on a device! If you have an existing email address with us, or aren't prompted to set a recovery email, log in to your Email & Office dashboard. In your Account Information section, you'll see if you've set one or not. If you don't have one set up, click Add recovery email, enter your email and click Save. Then skip to Step 3, set up your email on a device. If your login info doesn't work see the trouble with logging in article.